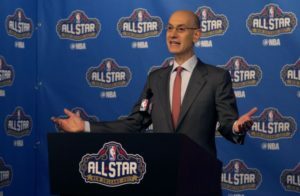 Brentwood, Calif— Adam Silver continues to push the envelope and show why he’s the most progressive Commish in sports. After a countless run of embarrassing competitive All-Star games (see Anthony Davis 2017 record breaking 52 points on roughly 200 uncontested fast break dunks ), Silver looks to spice up the game throwing it back to the playground of picking your own team. Lebron & Curry will pick players with the possibility to go against their own teammates with inner conference match ups and not having to pick solely within your own conference — Captains will pick from the pool of starters and reserves. Reserves will be selected by NBA head coaches and announced Tuesday, and the full team rosters will be announced Jan. 25. Adam Silver turning the All-Star game into gold. 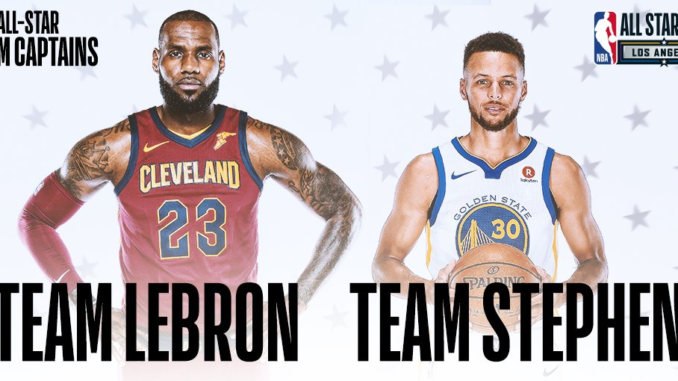 The All-Star game starters that Lebron and Captain Curry will choose from: Giannis Antetokounmpo, DeMarcus Cousins, Anthony Davis, DeMar DeRozan, Kevin Durant, Joel Embiid, James Harden, Kyrie Irving. Interesting to see if Lebron picks KD with his first pick (Lebron gets first pick since he was the leading vote getter, Steph was 2nd) , leaving Steph with Giannis, Harden, or Davis you would think for his first pick. Whatever the teams may be, imaging Steph guarding Klay or KD guarding Draymond shows the new formats endless possibilities of fun. Hopefully this sets a trend for MLB and The NFL to do something and make the All-Star game fun again. NHL has been innovate for years with their All-Star weekend and its very entertaing. 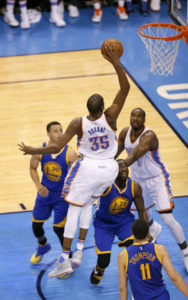 I can’t wait to see the trash talk when KD dunks on Draymond (again). This is the first must watch exhibition game since Lebron’s rookie year in the league.